REWARD will use a holistic approach for the enhancement of the thermal efficiency and an improvement of the combustion quality. 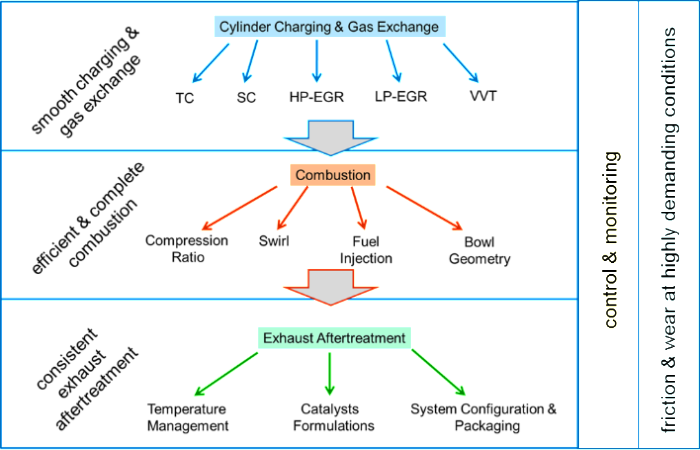 The energy conversion in Diesel engines can be split into three major items which strongly interact: Smooth cylinder charging & gas exchange, Efficient and complete combustion and Consistent exhaust aftertreatment. Other important aspects, i.e. Control and monitoring, and Friction and wear will also be taken into account in the holistic, see Figure. The thermodynamic engine cycle must accomplish the highest possible charging of air and EGR mass to achieve highest thermal efficiencies. A smooth charging is achieved by optimum selection / combination of turbo- and supercharger concepts, high- & low pressure EGR concepts and (variable) valve timings. The optimum charging is one of the main challenges of downsizing concepts which enhance the specific power ratings of engines (kW/l). Parameters for combustion concepts are the compression ratio, charge motion (swirl, tumble), fuel injector designs / injection characteristics and the combustion bowl geometry. Individual parameters which support the mixing of fuel and air for a complete combustion induce losses which must be minimized. Advanced concepts of REWARD focus on the reduction of swirl which impedes the cylinder charging and increases wall heat losses. 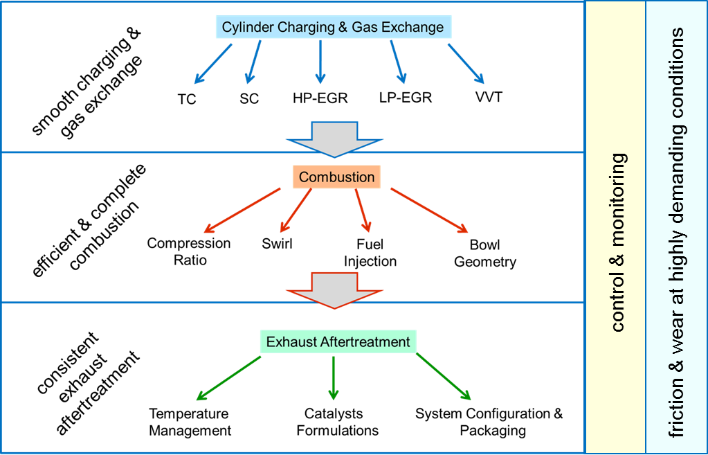 Both the thermodynamic engine cycle and the combustion concept define the characteristics of the exhaust. The aftertreatment system must provide a consistently efficient conversion of harmful emissions at all Real Driving conditions. This is accomplished by two approaches. First, the exhaust temperature is controlled by the engine and thus kept in a range which is favourable for all catalytic reactions. Second, the catalysts are adapted to the characteristics of the exhaust e.g. by new chemical formulations or optimum combination of available concepts for individually specific conditions. Optimum system configurations aim at compact designs and reasonable packaging on vehicles. Besides of the conventional applications for system control the controllers assure a certain system performance through the vehicle’s life. Modern approaches focus on adaptation functions which compensate for deteriorations of individual components (e.g. ageing of catalysts), model based observers. Many new developments for the enhancement of the thermodynamic engine cycle are also challenges for the mechanics and tribology. All approaches such as the downsizing concepts must be evaluated also from the mechanical point of view. The holistic approach does not only refer to the technical areas but also to different applications such as classes of passenger cars. This is important because the same conceptual approach e.g. downsizing may lead to completely different technology routes which strongly depend on the vehicle class. The extreme downsizing concept of a class A car applies a 2-stroke concept, while the D/E class application aims at an increase of specific power rating by an improved 2-stage turbo charging and a quiescent combustion concept. The holistic approach and methodology is built in accordance with the automotive value chain, i.e. strong cooperation between OEMs and TIER 1 and TIER 2 suppliers. Take a look at all participating organizations.